When you purchase gold piping string from North Coast Music, you will receive the exact diameter (.080") and exact color as the gold piping used on Vox amps in the 1960s. Solid polypropylene plastic. We have this piping specially manufactured for North Coast Music to our exacting specifications, and it is only offered here. Sold in precut lengths for Vox amps or by the running yard. Enough piping to complete one: Super Beatle, Beatle, V130 Series 90 or AC-100 speaker cabinet. Also suited for a Grenadier XII (LS60) PA column. Enough piping to complete one: Royal Guardsman, V131 Series 90, Beatle 4x12 Half Stack (Baby Beatle cab), Westminster, T.60, 760 or AC-50 speaker cabinet. Also suited for Sovereign amps or a Grenadier X (LS40) PA column. Enough piping to complete one: Viscount, Essex, Kensington or AC-30 amp or a 730, Defiant, Conqueror or Foundation speaker cabinet. Enough piping to complete one: 1x12 AC15, AC-10, AC15TBX, Cambridge 30, Cambridge Reverb, Pacemaker or AC10C1 amp. Also suited for Berkeley speaker cabinets. Enough piping to complete most Vox amp heads or a Vox Pathfinder. Having trouble with the shopping cart? Click here to refresh. Prefer to purchase on Reverb? Click here. Fat Gold String for Rose Morris Vox Amplifiers - Vox amplifiers produced by Rose Morris between 1985 and 1992 used this thicker, .090" diameter gold piping. Solid polypropylene plastic. Extrenely limited supply, only available in the four packaged lengths shown below. When you purchase silver piping string from North Coast Music, you will receive the exact diameter (.080") and exact color as the silver piping used on Vox amps and organs in the 1960s. Solid polypropylene plastic. We have this piping specially manufactured for North Coast Music to our exacting specifications, and it is only offered here. US/Thomas White Grill Piping - US/Thomas style off-white piping, ~3/16" diameter, as installed around the grill area. This piping does not include a staple flange, it is press fitted into a slot that surrounds the grill area on most Thomas Vox amplifiers and speaker cabinets. Sold in precut packages for popular Thomas Vox amplifiers or by the ruuning yard. Cut from a roll, no returms, refunds or exchanges. White Grill Piping for Vox Beatle, Super Beatle or V130 Series 90 Speaker Cabinets. Also suitable for a Grenadier XII Column - One continuous piece about 3/16" in diameter and 135" long. White Grill Piping for Vox Royal Guardsman, V131 Series 90, Beatle Stack or Westminster Speaker Enclosures. Also suitable for Vox Sovereign amps or a Grenadier X column - One continuous piece about 3/16" in diameter and 120" long. White Grill Piping for Vox Viscount or Essex Bass amplifiers - One continuous piece about 3/16" in diameter and 112" long. White Grill Piping for Vox Buckingham or Berkeley Speaker Cabinets. Also suitable for Vox Kensington Bass amplifiers - One continuous piece about 3/16" in diameter and 100" long. White Grill Piping for Vox Cambridge Reverb, Pacemaker or Pathfinder amplifiers. Also suitable for all Thomas Vox head cabinets - One continuous piece about 3/16" in diameter and 74" long. UK/JMI White Grill Piping - English style white piping as used on Vox amplifiers. This piping includes a staple flange. Sold by the ruuning yard. You will be charged a fixed postage rate of $3.49 for orders from one to twelve yards. 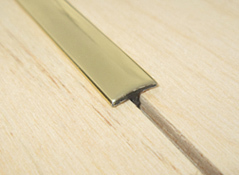 Gold Fascia Strip "tee molding" - AC-30 size - Cut 26" for any AC-30 model, this gold fascia strip separates the lower grill cloth and upper vinyl areas on the front speaker baffle board. ~3/8" wide x 26" long. Gold Fascia Strip "tee molding"- Viscount to AC-50 size - Cut 34" for any AC-50, Viscount, and other such wider models, this gold fascia strip separates the lower grill cloth and upper vinyl areas on the front speaker baffle board. ~3/8" wide x 34" long. "The American Home of the British Invasion"
VOX is a registered trademark of VOX Amplification, Milton Keynes UK. Hofner is a registered trademark of Hofner, Hagenau Germany. © 1996-2019 North Coast Music. All rights reserved.